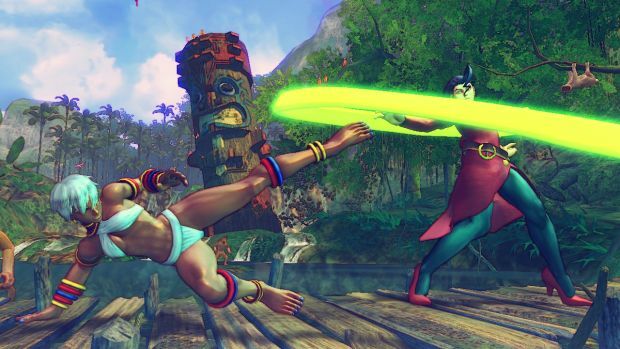 Ultra Street Fighter IV PS4 Review – FIGHT! It all comes down to this! FIGHT! It’s impossible to talk about Street Fighter IV without discussing the game’s legacy: the universal acclaim, the monstrous stream numbers, the seven years as the main event at EVO, the nearly seven million copies sold, and the ever present temptation of “Just one more match.” It’s a heck of a legacy for any game, no matter the genre, but Street Fighter IV has earned every bit of it. Some even say that it saved the fighting game genre. It didn’t; saying that implies that other developers in the genre didn’t do anything while Capcom sat on their hands for the better part of a decade. Excellent fighting games were developed during that time: Soul Calibur, Guilty Gear, Dead or Alive, Capcom vs. SNK, Virtua Fighter… all of those games exist. Street Fighter IV didn’t save the genre. But it did revive it from near irrelevance and resurrected one of the most important franchises in the history of the medium in the process. "The PS4 re-release marks what is likely the game’s last hurrah before Street Fighter V next year, and the end of an era for the fighting game genre. As a package, Ultra adds the most content to Street Fighter IV since Super Street Fighter IV in 2010, but the question remains: is the re-release of an update to a game from 2009 worth your time? Ultra Street Fighter IV marks the third and final (come on, AE 2012 doesn’t count) major revision to the Street Fighter IV formula, the definitive stamp on one of the best fighting games ever made, that period at the end of a sentence seven years in the making. The PS4 re-release marks what is likely the game’s last hurrah before Street Fighter V next year, and the end of an era for the fighting game genre. As a package, Ultra adds the most content to Street Fighter IV since Super Street Fighter IV in 2010, but the question remains: is the re-release of an update to a game from 2009 worth your time? The long answer depends on how much you like Street Fighter, and fighting games in general, and whether or not you already own a copy of Ultra Street Fighter IV. The short answer, however, is yes. 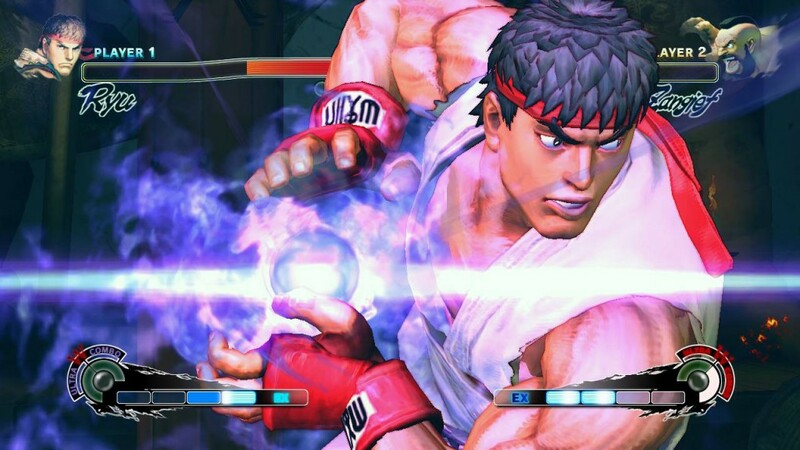 Like previous updates to the game, the biggest addition to Ultra Street Fighter IV is the new characters. Ultra adds five new fighters to Street Fighter IV’s roster, boosting the number of playable characters up to an impressive forty-four, a number almost unheard of in one-on-one fighters. 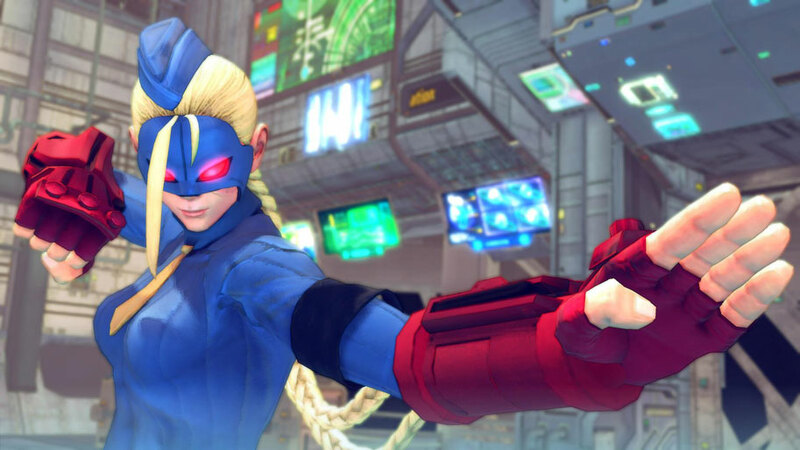 Four of these new characters – Hugo, Poison, Elena, and Rolento – previously appeared in Street Fighter X Tekken, while the fifth, Decapre, is making her first appearance in the series. None of these characters are new in the truest sense of the term, which is a shame. Even Decapre, who is supposed to be a completely new character, is just an evil version of Cammy that shares many of the latter’s animations. This was no doubt a cost-cutting move on Capcom’s part, but the lack of “new” characters in Street Fighter IV’s last update is still disappointing, if somewhat expected given that Street Fighter IV is more than six years old and a majority of the original team has moved on to other projects. "In a rather inspired move, Capcom has also provided players with the ability to select which edition of a character they would like to play, which makes for some very interesting matchups. The new characters may not have that new car smell aesthetically, but each brings a unique bag of tricks to Ultra Street Fighter IV. Rolento, for instance, is a hit and run character that can control large areas of space at once, while Elena is an offensive kicking machine capable of big combos. Hugo, meanwhile, is a grappler with a ton of health (and a huge hitbox), and perpetual partner in crime Poison is more of a cross between Crimson Viper and a traditional Shoto. Decapre rounds things out with a dash and teleport that allows her to attack from multiple angles, keeping opponents on their toes. Of course, there have been a number of balance changes to the other characters, as well. The changes are pretty extensive, but Capcom has been kind enough to outline them in a handy YouTube playlist. They’re are largely meant to even out the tiers in the hopes of making the game more competitive, and it’ll be hard to see how well Capcom did until the community has spent more time with the game, though initial impressions are positive. I don’t think anyone is mourning the loss of the vortex. In a rather inspired move, Capcom has also provided players with the ability to select which edition of a character they would like to play, which makes for some very interesting matchups. 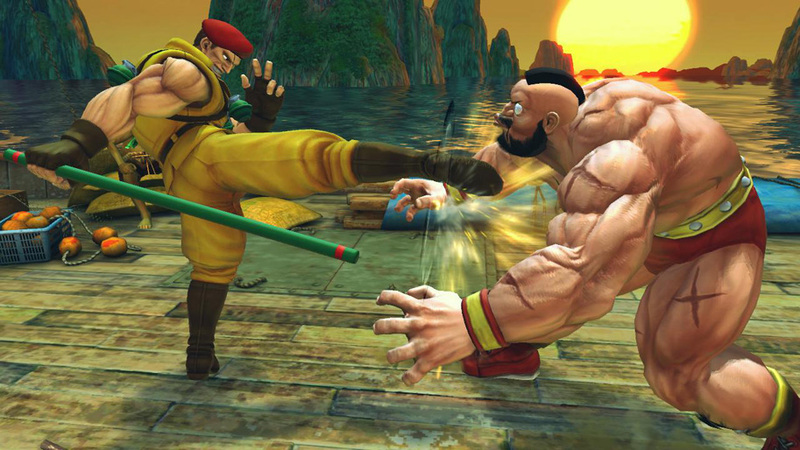 Wanna pit the incredibly powerful Street Fighter IV version of Sagat against AE 2012’s nasty Yun? Or maybe you want to toss Super Street Fighter IV’s beastly Akuma into the ring with Ultra’s buffed Ken? You can do that, at least offline, and it’s a cool feature that allows players to jump into the game with any version of a character while being able to enjoy all of Ultra’s other additions, which are considerable.
" Capcom has finally gotten around to adding Ultra specific challenges for the entire cast, but they’re not much good for anything other than practicing specific combos and getting a general feel for each character. There are also six new stages to choose from, one of which features an incredibly cool pair of T-Rexes and gives off serious The Lost World: Jurassic Park vibes, and a number of new gameplay features and modes, as well. The new Red Focus mechanic allows you to burn meter to absorb more punishment than a normal Focus Attack, while Delayed Wake Up provides a way out of the infamous vortex, and makes knockdowns a guessing game for the attacker and the defender, rather than just the latter. The last puzzle piece comes to us in the form of Ultra Combo Double, which lets you access both of your character’s Ultras at once at the price of reduced damage. Each of these changes seriously impacts the way the game plays, and will keep the most competitive World Warriors busy for a long time. These new gameplay wrinkles are complimented by a number of new modes and quality of life improvements like an online training mode, a series first, as well as Elimination, a 3-on-3 match that operates similarly to a round in King of Fighters. The last big addition is native YouTube uploading, which allows you to save both online and offline matches and upload them to YouTube without ever leaving your console, though said videos are unfortunately capped at 480p. Unfortunately, all of these additions throw into light all of the things that Ultra Street Fighter IV still lacks. Capcom has finally gotten around to adding Ultra specific challenges for the entire cast, but they’re not much good for anything other than practicing specific combos and getting a general feel for each character. As good as Street Fighter IV is, Capcom’s general lack of interest in the challenges (it took them months to finally release the ones for Ultra) shines a bright light on one of Street Fighter IV’s largest problems: this is a game that has no interest in teaching you how to play. "Neither one of these things – the lack of teaching tools of any real merit, and the inconsistencies in presentation that mostly crop up around the new characters – is a dealbreaker, but it will be more than a little jarring to new players who are making their first journey into the wonderful world of Street Fighter. To be fair, this is a problem fighting games have been struggling with since the genre’s inception. It’s a ridiculous problem, really, and any other genre would be crucified for it. Could you imagine if RTS games like StarCraft didn’t feature comprehensive tutorials? What about something like DOTA 2, Braid, or STALKER? It would be awful. People would be infuriated. But somehow, it’s become not only commonplace in fighting games, but acceptable. This was a problem ten years ago when only Tekken and Soul Calibur had anything resembling passable teaching tools, but now, when Killer Instinct’s tutorial teaches you not just fighting games, but universal concepts like frame data, buffering, and hitboxes? Now, when Blazblue will teach you every mechanic and major combo for every character? Now, when Injustice allows you to view frame data, and when it’s challenges will walk you through a number of complex ideas and mechanics? It’s absolutely unacceptable that Ultra Street Fighter IV’s trials are so barebones, and baffling that Capcom didn’t use what is undoubtedly their last chance at updating Street Fighter IV to add more complete teaching tools. It’s also rather depressing that Capcom hasn’t given the new characters the nice pre-fight videos that occur when you fight their rival in arcade mode. Neither one of these things – the lack of teaching tools of any real merit, and the inconsistencies in presentation that mostly crop up around the new characters – is a dealbreaker, but it will be more than a little jarring to new players who are making their first journey into the wonderful world of Street Fighter. "The few problems that the game does have do little to diminish Street Fighter IV’s enduring greatness, especially when you consider the $25 price tag, which includes all of the previously released DLC costumes, and the fact that it supports PS3 fightsticks, provided you have a DualShock 4 connected for each one. Much has been made of the technical issues that plagued the PS4 version on release, and with good reason. They were considerable, and including input latency, lag in online matches, animation problems, disappearing projectiles, and a number of audio issues. In fact, the problems were so serious that the PS4 version was dropped from Evo, the world’s premier fighting game tournament, in favor of the Xbox 360 version. It was a rough few weeks for Capcom and Sony, especially considering that this version was supposed to be the one that finally brought 1080p resolution and 60 frames per second to a console version of the world’s most popular fighting game. Capcom and Sony have been working hard to set things right, however, and the final result is easily the best version of the game on consoles, just as we were promised. The few problems that the game does have do little to diminish Street Fighter IV’s enduring greatness, especially when you consider the $25 price tag (for the digital version. There are no physical versions at the time of this writing), which includes all of the previously released DLC costumes, and the fact that it supports PS3 fightsticks, provided you have a DualShock 4 connected for each one. It’s kind of a steal, really; Ultra is easily the best and most accessible console version of the title on the market and will do more than enough to keep you busy until next year’s Street Fighter V.
I don’t envy Capcom, having to follow up on this game; having to outdo 44 characters, Ultras, and Focus Attacks, the endless amount of hype. How do you begin to approach that, that legacy? I don’t know. It won’t be easy, but we’ll always have Street Fighter IV. And in that regard, in securing that legacy, Ultra does more than enough. So, whaddya say? You wanna go another round? The same great gameplay Street Fighter IV is famous for. New characters bring unique fighting styles to the game. Online training mode and Elimination battles are welcome additions. New stages are really cool. Red Focus Attacks, Ultra Combo Double, and Delayed Wake Up add new layers of depth to an already deep combat system. Edition select means you can play your character as you best remember them. 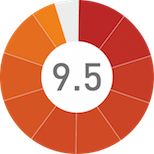 Balance changes help remove some of the game’s more troubling issues. YouTube functionality makes it easy to save and upload your matches. 1080p resolution and 60 frames per second on consoles. The PS4 version supports the use of PS3 fightsticks. Poor teaching tools even with new challenges modes. Inconsistencies in Arcade presentation with new characters. YouTube uploads are limited to 480p. Edition Select doesn’t work online. None of the new fighters feel new aesthetically. No retail version. Despite its troubled launch, the PS4 version of Ultra Street Fighter IV honors Street Fighter IV’s impressive legacy while adding a few wrinkles of its own, making it an essential purchase for long time fans and newbies alike. It is easily the best and most accessible console version of the title available, and will do more than enough to keep you busy until Street Fighter V. If you’re looking for the definitive edition of one of the best fighters on the market, look no further.